WEDNESDAY, 30 MARCH – Universiti Malaysia Sabah (UMS) would be the first university in Malaysia to offer an eco-tourism package in the campus through its EcoCampus Visitor Information Centre (EVIC) scheduled to begin in April this year. 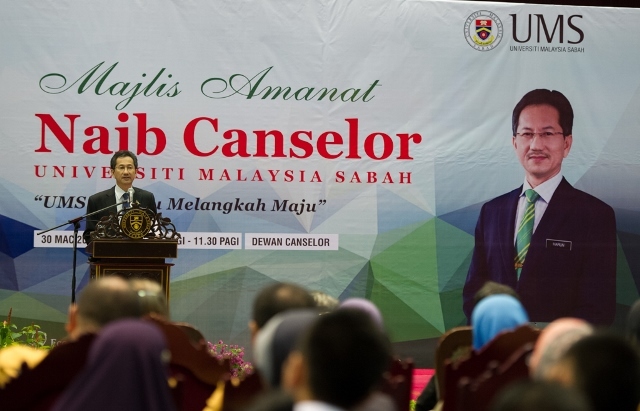 This was stated by the Vice-Chancellor of UMS, Professor Datuk Dr. Mohd Harun Abdullah in his message in conjunction with the Vice-Chancellor’s Message 2016: UMS Moving Forward in Unity, at the Dewan Canselor (Chancellor Hall) this morning. According to him this initiative was in line with the launching of “Malaysia 101 Edutourism Packages” by the Ministry of Higher Education (MOHE) through the University Community Transformation Centre (UCTC) in collaboration with the Ministry of Culture and Tourism, and the Tourism Malaysia on 15 August 2015 that centred on the concept of tourism in the campus by offering tourism packages based on education. “EVIC Centre at the Faculty of Science and Natural Resources (FSSA) would be the centre for tourism information and tour packages in UMS, with the key component of this centre to include the gallery and tourist information counter, centralised ticketing purchases and tour packages including a gift shop. “To make EVIC more interesting, apart from the unique landscape, and eco-café would also be built for the convenience of visitors to UMS, and would be expanded further to include FSSA lake area where it would be further developed into an “EcoCampus Park” that would also be made into a major tourist attraction in the future,” he said. He added that so far there were five tour packages offered by UMS, which included daily and overnight packages based on Green Tourism and Nature Tourism. “The five packages are Gallery and Museum Tour, Nature Delight Tour, Architecture Heritage Tour, Sunset Tour and Nature Education Camp. “EVIC would also serve as a centralised ticketing sales and facilitate the purchase of tickets to the intended locations.